Josef Matthias Hauer's music, especially his twelve-tone compositions, hardly presents a problem for human hearing; but their entire meaning can only be grasped with the help of additional clarification. The music, namely, is a component, even in a certain sense a result, of the composer's very individual philosophy, which is not easily accessible, especially since its understanding is still hindered by some of Hauer's idiosyncrasies. Thus, we will attempt in the following to provide an access to this world view of Hauer's, which may illuminate his philosophical viewpoint and facilitate further study of his related writings. Since it is impossible to give an exhaustive overview of his world of thought, we will begin with a few characteristic quotations, from which a suitable interpretation will develop. From these three passages, it can be seen that Hauer believed in a cosmic order, a harmony in the sense of the ancient harmony of the spheres whose laws correspond to our earthly music. But how these laws should be specifically obtained is a second set of problems, which we will introduce with some further quotations. From these further passages we see that Hauer understood the laws of music as something very specific, namely tempered tuning. This, as we know, involves a detuning of the interval proportions given by nature, where by “nature” Hauer means the overtone series, whereas today we know7 of another much more important natural component: the psychological constitution of human hearing. However, our purpose here is not a critical statement on Hauer's ideas, but as intensive an understanding as possible of his viewpoint. And in this sense it is appropriate to assume that Hauer was right in seeing tempering as something spiritual of material nature; because tempered tuning (by which he means equal tempering) is in fact an invention of the human mind, which thereby uses mathematics, and these mathematical values appear as laws of nature. This is therefore a pointed separation of mind and matter, connected with the idea that only so-called atonal music, based on tempered tuning, is in a position to reproduce the aforementioned cosmic order, the harmony of the spheres. 1. Where do these ideas come from? 2. What truth lies in this philosophy? 3. Harmonic symbolism as a particular type of numeric symbolism, applied almost exclusively by the Greeks. We will apply ourselves somewhat more closely to the second possibility, relating cosmos and music to one another-numeric symbolism. It played a large role above all in China, and we will use this culture as our example. First, however, it must be emphasized that the basis of this thought is analogical relationships, which were seen in China between all imaginable domains and were illustrated in the application of numbers, whereby an extensive system of logical correspondences emerged. This way of thinking appears even in the most ancient Chinese philosophical writings, e.g. the Hung-fan,11 from whose statements the following table was compiled. To be more exact, we constructed the table incorporating of later stipulations from the Yüeh-ling,12 so that each concepts has two numbers assigned to it, the differences of which are always 5. As can easily be seen, the seasons, elements, and directions stand in a significant interrelation of analogies; e.g. winter is cold like the North and the rainy (water), summer is hot (fire) like the South. If one compares the number values of the bars of the cross with the above table of analogies, it becomes apparent that 1 and 6 mean North and Winter, 3 and 8 East and Spring, 2 and 7 South and Summer, and 4 and 9 West and Fall; a meaningful illustration has thus emerged, which symbolically contains some of the important aspects of the cosmos. This is also a kind of outline of the Ming-Tang, the Chinese calendar house from the later Sung dynasty, whose 9 spaces correspond to the numbers.14 There were, furthermore, 12 “stations of grace” (perhaps also windows) in the calendar house, which the Emperor included when he gave his instructions-corresponding to the 12 months. These stations were likewise symbolized by numbers, and they form a circle in our illustration; the arrangement of these numbers has a connection to that of the bars of the cross; yet this is no longer strictly feasible, since there are 12 numbers. If one follows the inscribed twelve-pointed star, beginning with 1, the sequence of the table of analogies emerges as the circle of fifths; if one proceeds in the other direction, clockwise from 1 (past 8, 3, 10, etc.) around the circle, then the familiar chromatic scale emerges. The result of this observation is a system built of numbers, in which seasons, directions, elements, and tones are unified into a symbolic layer, forming an analogy to cosmic principles. For our viewpoint, the tones are naturally the most important, their succession being identical with the stations or windows of the calendar house, so that they have a direct relationship to the individual months. From this it follows that in Chinese ritual music, their scales (selected pentatonic scales) must each be transposed by month to a different keynote! The music therefore has a symbolic connection to cosmic principles. The third type of symbolic representation of sound-cosmic connections is harmonic symbolism. It differs from the pure number symbolism of the previous example in that only those numbers that are the acoustic basis of music can be used for application. These are the so-called interval proportions, as they have been used since ancient times in the most varied cultures. In our own cultural domain, they were discovered by the Pythagoreans through experiments with the monochord. Pythagoras, however, played a key role above all with regard to the sound-cosmic ideas we have outlined. It was obviously he who, one might say, rationalized those mythical narratives in combination with the emergence of the scientific mode of thought in ancient Greece, and with the help of the aforementioned study of proportion, brought them into a mathematic and scientific form. Unfortunately, this can only be gathered in fragmentary form from the Pythagorean legacy; yet with Plato, who was indubitably influenced by Pythagoras, we find very clear references to what has since been handed down as “the harmony of the spheres” or “universal harmony.” And these texts of Plato are characteristic evidence for harmonic symbolism. Most important of all is a statement in his Timaeus dialog17 describing the creation of the so-called Soul of the World. Here, Plato tells us that the world as a whole has a soul-just like all living beings-and describes the almost architectural creation of this structure by the Demiurge, Plato's lower god. The process is described in detail, but in such a way that it makes no sense to the reader. The passage is, in fact, a secret text, only understandable by readers who approach it with certain prior knowledge. This fact already points to the Pythagoreans, whose sect was indeed a kind of mystery religion with a very strict policy of secrecy. But the essential knowledge for the solution of the text is connected with the Pythagoreans; because it relates to the interval proportions, whose mathematical understanding-in no way simple-is assumed here, even though only the subtlest references to it can be found. Besides the Timaeus scale, there are a few further examples of harmonic symbolism that we cannot discuss here. About a hundred years ago, Albert von Thimus applied himself exhaustively to this domain and wrote a two-volume work on it, entitled The Harmonic Symbolism of the Ancients.20 In this work he begins with the assumption that harmonic symbolism was the core of ancient wisdom, and provides extensive and dense material on this topic. Hans Kayser built his ideas upon those of Thimus, and devoted space in his “Kayserian harmonics” to speculative symbolism going much farther than Thimus. Today we know that Thimus proceeded very speculatively,21 and therefore we must make many exceptions to his theses; but once this is done, the true core of harmonic symbolism remains undisturbed. Thus we conclude the outline of the three forms of sound symbolism, and can return to Josef Matthias Hauer. The reader will have already noticed the similarities existing to Hauer's quoted statements. In fact, he was very familiar with the second and third forms of sound symbolism. Interestingly, Hermann Bahr made him aware of the work of Albert von Thimus;22 but at this time (1918), Hauer already knew Chinese symbolism, as can be seen from the correspondence, and from this perspective he repudiated Thimus, as we shall see. We have now dealt with the question of the origin of Hauer's ideas about a musical order of the cosmos, and must turn to the second question: the truth of the content of these ideas. The answer to this question should be anticipated: it has been proven that true factual content lies at the basis of the sound symbolism described, because the foundations of music are also provable as general laws of nature. Therefore, a close connection to harmonic symbolism exists; because this is a matter of the interval proportions, which constitute the material of harmonic symbolism and are also present in nature. Thus a circle, so to speak, is completed. If Pythagoras, as can be reconstructed from later sources, presented the idea that identical laws existed in nature (the planetary spheres), in people, and in music, but carefully kept this wisdom secret and only passed it on in symbolic code, then today we are in a position to prove this connection scientifically. It should also be noted that the values given by Kepler have remained constant up to the present, despite ongoing changes in the orbits; because these are angle measurements that are hardly affected by these changes.25 Of course, the intervals do not really make sounds, since these are ideal proportions, but they can be transposed into the domain of hearing and be made audible there. The same goes for all other natural harmonic laws. At the beginning of the 20th century, the crystallographer Victor Goldschmidt also found proportional laws that he recognized as harmonic in the structure of crystals,26 and later Hans Kayser successfully expanded this fundament of nature in his “Kayserian harmonics.” Modern-day “fundamental harmonic research,” established by the Author in Vienna in 1965, stems from this tradition. Since then, numerous further harmonic laws have been proven by inductive methods, building upon empirically confirmed facts, in astronomy, crystallography, chemistry, physics, botany, zoology, and anthropology.27 There are similar interval proportions in significant places everywhere in nature, so that a great analogical interrelation emerges between the most varied domains and sciences. But an analogy also exists, as has been mentioned many times, between these natural laws and the foundations of music; because intervals also appear there, and these have been based on simple number ratios since ancient times. Here an argument often heard today presents difficulties: that these mathematical foundations are mere convention, and are based above all on acclimatization. If this were so, then the relationship between nature and music would simply be coincidental, or entirely arbitrary. However, this is not the case; because fundamental harmonic research can also provide the proof that there is a natural psychophysiological predisposition of human hearing, on the basis of which the simple proportions are favored and have therefore emerged as fundaments from the laws of nature. This predisposition of hearing will now be discussed more thoroughly. Our investigations into the physiological predisposition of hearing are based on experiments and their interpretation by Heinrich Husmann.28 He points out that, based on the non-linearity of the human ear, supplementary tones emerge whose vibrations cause interferences. These are the subjective overtones, which have the same laws of structure as the objective, and-with at least two simultaneous tones-combination tones (also of higher orders). From Husmann's specifications, we have prepared the following table, from which it can be seen that the interferences are different for each interval, since in each case a different number of combination tones is identical with overtones. On the basis of the differing identities, a series of intervals emerges. This series also shows the degree of purity of the respective intervals, since the combination tones falling in the gaps in the overtone series can be viewed as dullings of the natural sound. The third column now shows that the sequence yielded corresponds very precisely to the differentiation of consonances and dissonances, known for centuries, and that each interval has a specific degree of sonance, which is expressed in percentages (2nd column). It must be mentioned, however, that for some conditions of this musical predisposition30 of hearing, a psychical predisposition works along with the explained physiological one. The 12 familiar interval perceptions are obviously anchored psychically; they are inborn sensory qualities, just like colors, for example. The investigation of this psychical predisposition, however, yields another important result. Namely, the fact emerges that on this psychical plane, none of the kind of exactitude is assessed as with the physiological disposition, indeed quite the contrary: the interval perceptions have margins allowing for deviations of up to 40% of the distance between two semitones to be assigned the correct perception (these distances are the logarithms of the proportions, since as is known we hear logarithmically). This “adjusted hearing” of deviations is also an important fundament of music, and is of great significance for our topic. Those detunings of pure-tonal intervals consciously induced by people, such as the tempering of instruments requires, also belong in these domains of adjusted hearing; and here we are reminded immediately of Josef Matthias Hauer, for whom tempering is the most important fundament of music. The mathematical values of tempered tuning are not natural laws, as we have already said, but the possibility of tempering in principle is anchored in nature, in as much as adjusted hearing assures that deviations from pure-tonal tuning are corrected and do not bother us. The mention of adjusted hearing has another result for our debate. Namely, we can assume that the ancient Chinese (as well as the Greeks) were aware of this quality of the sense of hearing. 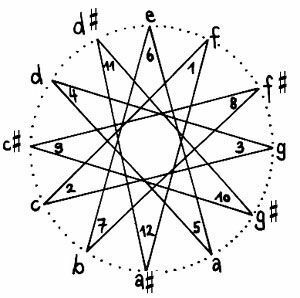 In the diagram of the 12 Lü in the form of a twelve-pointed star, the twelve tones have exactly equal distances, and this equality cannot be attained with pure-tonal proportions (or their logarithms)! Only the logarithms of equally vibrating tempered intervals have the same distance in the psychical hearing space, and the Chinese diagram can be perceived as a hearing space bent into a circle. Our investigations into sound symbolism and the harmonic laws of nature have provided the requisite foundations for a presentation of Hauer's philosophy, and we can now give an assessment of his viewpoint. 2. If a connection of Hauer to harmonic research is impossible, given how much its modern results contradict his ideas, then it will work all the better with symbolism. Since Hauer continually places the spiritual in the foreground and pits himself against the material rooting of music in the overtone series, he ends up on the same plane as symbolism, this being also a product of the human spirit. At best, a connection with Chinese number symbolism is possible, since it is on an astonishingly high spiritual level and is also fully cosmically oriented. Hauer's entirely logical conclusion is that this type of sound symbolism corresponds at best to those musical foundations that are also created entirely spiritually, and such is the case for tempering, the mathematical principles of which are the product of human thought. This unification is highly logical-only on this plane is the true “musical” order of the cosmos not perceived, but only its symbolic image. b) the natural harmonic laws, formed from proportions of whole numbers, if played on tempered instruments, would also yield the same sensory qualities. Josef Matthias Hauer cannot know the modern results of the harmonic research that his philosophical ideas confirmed in principle, albeit in a different form from what he assumed. His life's work will thus be incorporated into the great framework of our knowledge of an all-embracing musical universal order; how that can happen, we have indicated in our studies. But precisely because he knew nothing of the real existence or truth of a harmonic plane of creation, all the more credit is due to Hauer for his own belief in a great spiritual connection in which music plays a leading role. To this idea he dedicated his life, with great personal sacrifice. 4 J.M. Hauer: Vom Wesen des Musikalischen, Leipzig etc. 1922, p. 34 ff. 5 J.M. Hauer, Deutung des Melos, op. cit., p. 22 ff. 14 ibid., p. 132 ff. 15 ibid., pp. 170, 185. 16 At the indication of M. Schneider, the tone star was moved over by one semitone; no reason for this has yet been found. This constitutes a correction. 18 R. Haase: Harmonikale Synthese, Vienna 1980, p. 25 ff.